The Scout DX 1000 is a sleek, and efficient Bushnell laser rangefinder. This lightning fast rangefinder can fit comfortably into your pocket, but it packs a punch that makes it perfect for gun and bow hunting. 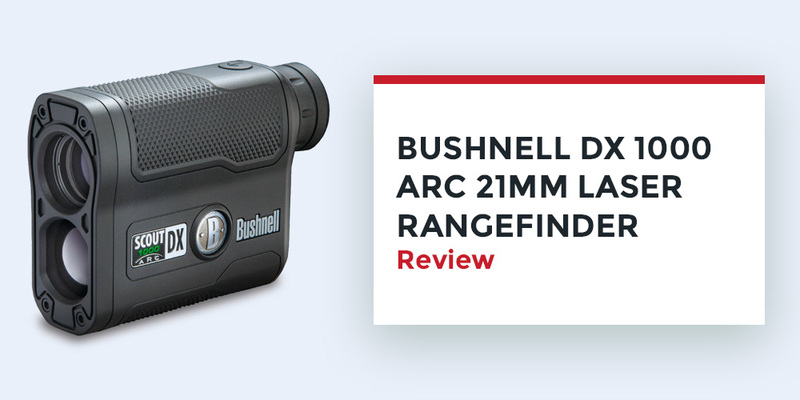 The ARC rangefinder is composed of an ESP turbo processor, which allows you to quickly acquire your target, and calculate precise distance measurements so that you can make the perfect shot. So if you are searching for an intuitive and effective rangefinder, check out the review below. As I mentioned earlier, the Scout DX 100 has a range finder accuracy of .5 yards, dramatically reducing the chance of you missing your shot. This rangefinder is composed of an E.S.P (Extreme. Speed. Precision) processor, which facilitates swift and accurate readings so that you can achieve accuracy up to half a yard. The processor also displays distance in 1/10 yard increments out to 125 yards, which only enhances your shooting experience. The Bushnell DX 1000 also boasts of top notch construction, starting with its rubber-armored housing that protects all of the inner components from water and shock. This sleek unit is compact enough to fit in your pocket; however it is sturdy enough to withstand all weather and terrain. The 6.6 oz fog proof rangefinder also has extended eye relief for added comfort, making it perfect for anyone wearing glasses. The laser rangefinder is also composed of Angle Range Compensation (ARC), which works to improve your gun and bow hunting experience. ARC works by calculating compensated distance using terrain angle, so that you can have more accurate readings when you shoot. You can select between the bow and rifle modes, as each has their own features. The ARC bow mode on this essential two-in-one unit provides a true horizontal distance up to 99 yards. On the other hand we have the ARC rifle mode, which provides holdover/bullet-drop in inches, centimeters, MOA, and Mil. When it comes to performance, the scout DX 1000 excels in several areas. Firstly, the rangefinder has a diopter adjustment for crisp viewing, as well as 6x magnification for precise targeting, and a 21mm objective lens for optimized light transmission in low light conditions. There is also a Variable Sight-In (VSI) provided, which gives you the option to choose from 1 of 4 separate sigh-in distances, including brush, bullseye, and scan mode. The bullseye mode allows the unit to report which one of two objects is closer when you are faced with a split reading, while the brush mode reports the farthest object in the same situation. This scout rangefinder also has a maximum range of 1000 yards on reflective targets in good conditions. As mentioned briefly above, the Scout DX 1000 has a 6x magnification and a 21mm objective lens which is a change from the 5x magnification and 24mm objective lens seen in its predecessor. This rangefinder also has a field of view of 393 ft at 1000 yards, which is a more powerful and wider coverage area then seen in the Scout 1000. The Bushnell DX 1000 comes with a CR2 3 Volt battery, a carrying case, a tripod mount, 10 ballistic charts, and a neck strap. This rangefinder also boasts of a black LCD display for clear viewing, and is compatible with the magnetic attachment system. Q: What is the tree ranging, and deer ranging performance of the Bushnell Scout DX 1000? Q: Does the unit display in red? 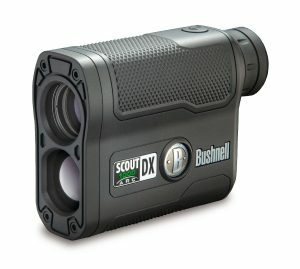 A: No, the Bushnell Scout DX1000 only displays in black, however the display is really easy to see. 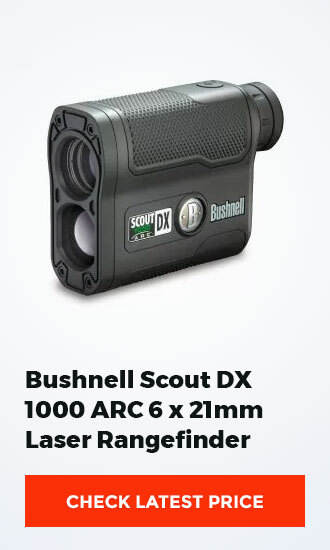 All in all, the Bushnell Scout DX 1000 is an accurate and powerful laser rangefinder, which can easily fit in your pocket. This dual purpose rangefinder is perfect for your hunting needs, and you should carefully consider it for this purpose.